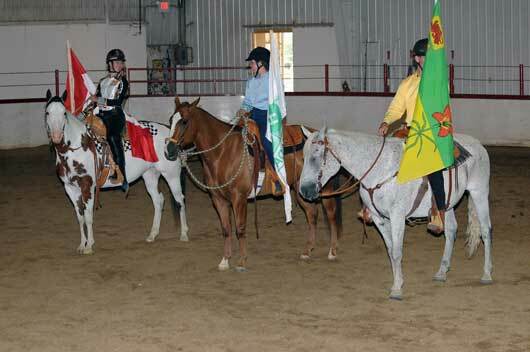 The 2011 Youth Equestrian Tournament (SYET) is now in the record books (no pun intended)! 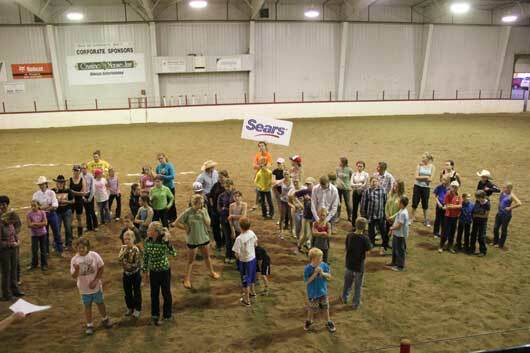 Once again, this initiative of the Saskatchewan 4-H Council and the Saskatchewan Horse Federation (SHF) brought together the equine youth of the province to share in a weekend of competition, learning, friendship and fun. 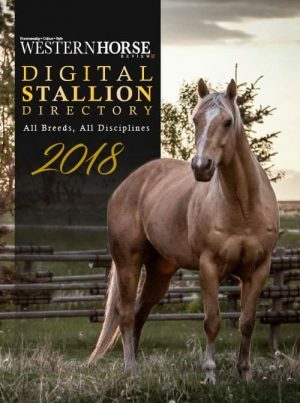 This year’s show was held for the second time in Moose Jaw from August 11th to 14th with 101 riders and horses taking part in this 4-day extravaganza. The 4-day event started with Thursday’s clinics. All clinics at the SYET were subsidized by an RBC grant which made it very affordable for all riders to take part. 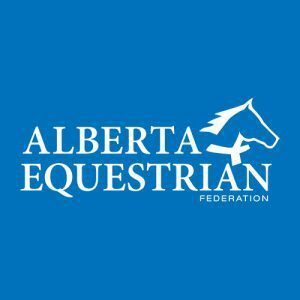 Clinic details were as follows: Barrels with clinician Sandy Stewart; Dressage with Shannon Sluser; Jumping with Alyssa Noonan; and Trail with Sandy Assman and Stormi Schlamp. A full day of learning and a chance to try something new was a great way to start the weekend. After a quick supper, there was a roping demonstration and fun competition. And what better way to top the evening off with ice cream. Flag bearers at opening ceremonies L to R Audra Cooper on Clayboys Sassy Girl, Melissa Turner on JT Go Special Pet, and Nic Metz on Radar. Again this year the riders were divided into colour teams of pink, purple, blue, lime, orange and black. The team aspect is to help to promote and build teamwork as the youth compete and collect points for their team while showing and participating in extra events during in weekend. These teams are made up of both 4-H and SHF riders. 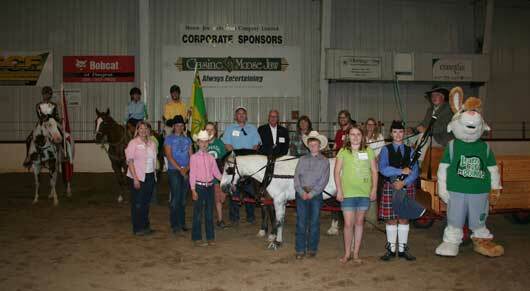 All equine youth were encouraged to intermingle for a chance to share in their love of the equine sport. On Friday morning, our RBC-sponsored Horse Sense Clinic, given by Tom and Kayla King, was offered to all participants and parents; yet one more great chance to get some learning in before the competition started for the weekend. Friday’s competitive events included Trail, Dressage, 4-H Judging, Western Horsemanship, and English equitation. 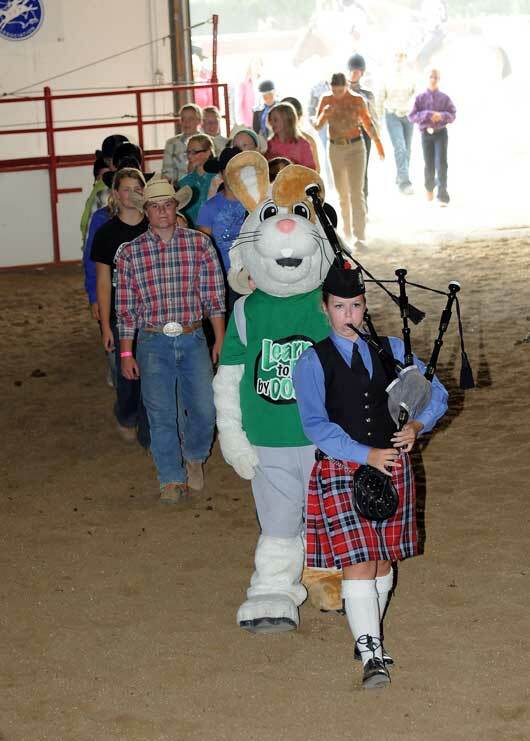 The march of athletes lead by 4-H member Emma Yeo and 4-H mascot Harold the Hare. It was then time for a quick break in the festivities for the Opening Ceremonies. The SYET registrants were led in by bagpiper Emma Yeo and Harold the 4-H Hare. Dignitaries arrived by horse drawn wagons driven by Neil Hastings and Don Moats. 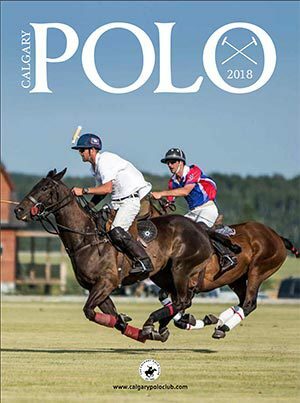 Dignitaries included: Master of Ceremonies Jordan Ewart (800 CHAB DJ); Mr. Lyle Stewart (Thundercreek Riding MLA); Ms. Andrea Lawrence & Ms. Esther Muriiti (Saskatchewan Horse Federation); Mr. Dean Pekeski (Western Potash); Ms. Kim Moats (SYET Show Manager); Ms. Melodi Hawkesford-Lee (South East Regional 4-H Specialist); Taitum & Jackson Pekeski, (Ribbon Cutter / Holder for Opening Ceremonies); Dylan Calvert (4-H Pledge speaker); Brittany Ruecker (Athlete’s Oath speaker); Grace McCullough (O Canada singer); Emma Yeo (Bagpiper). Thank you to all our special guests for the impressive Opening Ceremonies. We then resumed with the costume class that had an impressive 22 entries that were so excellent, the judge had to ask the audience for help! The evening then finished off with the reining classes. If you think that was a full long day, you would be correct: Long, but Fun! Saturday’s classes included Showmanship, English Pleasure, Show and Road Hack, Western Pleasure and the ever-popular Barrels, Poles and Keyhole (my favorite part of the weekend: a more relaxed time for visiting and horsing around with old and new friends while waiting for your time to turn and burn). Participants in the Amazing Race that was held Saturday night. But the best was yet to come: a Sears-sponsored evening that included a lovely meal and the “Amazing Race, YET version”! Excited colour teams raced around the grounds collecting clues and doing challenges to finish the race. Now, one would think that these kids would be too exhausted to play, but this was not the case. Over-excited kids with huge smiles, ran full speed around the grounds, one young lady on the purple team bounced just like Tigger when waiting her turn to do challenges. From what I heard around the barns, this was the highlight of the weekend so far, but time to sleep quick as we still had one more day. Sunday we were blessed with our 4th nice sunny day in a row! Maybe too sunny as it ended up being 34 outside, but the sun was appreciated as we started the morning outside with our jumping classes. Cross poles, 2’0” Hunter, 2’3” and 2’6” was followed by English equitation over fences. 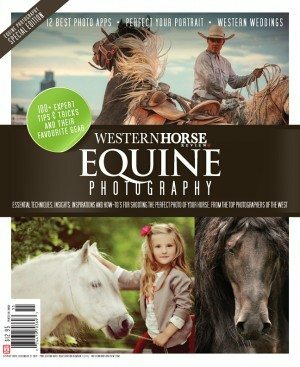 Then after a break we started into our Mane Meltdown classes of Western and English Pleasure, Western Horsemanship and English Equitation. The top riders from each colour team were invited back to participate in these prestigious classes. A huge crowd gathered to cheer on their favorite rider. Following this last bit of excitement, and last minute tabulations, was the Closing Ceremonies for the 2011 show. Sponsors, Contributors, Officials and Volunteers were thanked and awards were handed out, and with lots of hugs and “see you next year, participants started for home. Greenhawk; Moose Jaw Exhibition Company; Dana’s Doodles; Horse and Rider; Jesse Colt; Andrea Lawrence; Regina District Dressage Association; Cowgirl Finesse; Bin There Tack Shop; Crazy Horse Creations; Cowtown; Saskatchewan 4-H Council; Saskatchewan Horse Federation; SK Paint Horse Club; SK Quarter Horse Club; SK Arabian Horse Association; SK Morgan Horse Club; SK Pony Club; SK Appaloosa Horse Club; Wendy Erratt. Judge Monica Schlamp; Trail Judge Tammy Hayward; Dressage Judge Pat Michaels; Ring Masters Gail Wickenheiser and Stormi Schlamp; Show Manager Kim Moats; Show Secretary Roberta Robertson; Our amazing announcer Robert Ross; First Aid Team Dave Coats and Don Moats; Show Photographer Kim Reynolds. Kim Moats; Roberta Robertson; Heather Calvert; Elena Coats; Tammie Cooper; Logan Fouhse; Melodi Hawkesford-Lee (South East Regional 4-H Specialist). Logan Fouhse (committee member) & Abi Cockwill (Ribbon-hand-outer-extraordinaire). A huge thank-you to all who donated for the silent auction, purchased tickets on the cooler and to all who volunteered in any way, Thank you for helping make this event so successful. We look forward to next year’s show, and will be taking a 2-week break before we start planning for next year!